The Madshus Redline Carbon Classic Jr. Ski features a universal camber profile and kid-specific flex for those up-and-coming world champions who are honing their skills. The Redline Carbon Classic Jr. has the signature Madshus Speed Tip and P200 Nano Universal base that deliver race-worthy glide and stability. PR90 X Core: The PR90 X core is reinforced by Triaxial Carbon braiding technology, and is used because of its light weight and the ability to dampen the ride. The core is then 3D shaped for ultimate power transfer and weight savings. Triaxial Carbon Construction: Triaxial Braiding Construction is the process of interlocking strands of fiberglass and carbon fiber around the entire core. This unique method produces excellent torsional rigidity and strength while maintaining a lively feel and lightweight. 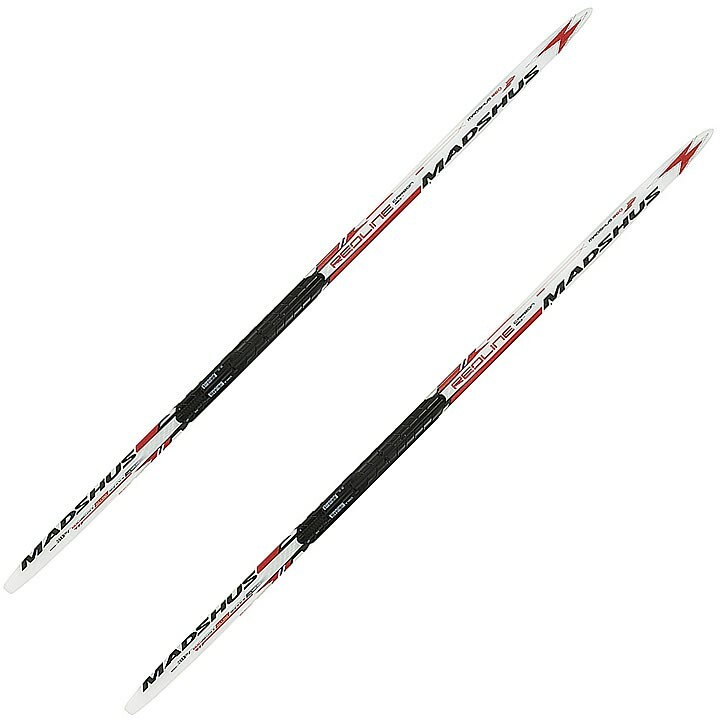 Madshus Speed Tip: A component of the ski's overall profile, Madshus Speed Tip offers the perfect splay needed to elongate the ski's pressure zone, ideal for colder snow conditions. CAD: CAD (Computer Aided Design) provides Madshus the opportunity to produce skis of incredibly complex 3-dimensional designs to accompany the high performance characteristics of the Madshus RED and Champion skis. From initial testing, Madshus industrial designers and engineers process the feedback from athletes and digitally simulate changes to evaluate current and proposed properties of the skis. P200 Nano Zero Base: The P200 Nano Zero base features a rubberized kick pocket inset in the P-Tex to provide perfect kick in the most difficult, 0 degree Celsius, wax conditions. Featured exclusively on the REDLINE series, the P200 Nano Zero combines incredible durability with unmatched wax permeability to create the pinnacle of racing bases.